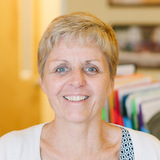 Joann has been involved in the Montessori environment for over 18 years. Joann graduated from Niagara University with her Bachelor of Science degree in Business Administration and Finance. She worked as an Assistant teacher in a Montessori class for five years as well as administrative duties.